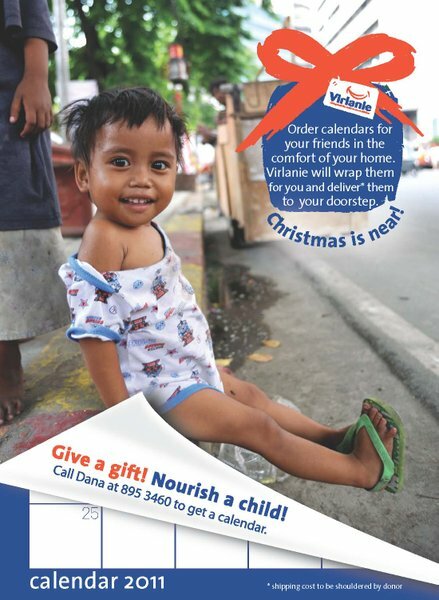 To commemorate its 18th anniversary, Virlanie published an 18-month calendar which runs from July 2010 to December 2011. The calendar features 18 engaging photographs by Sebastien Cuvelier and Mark Quisquirin which show a glimpse of the lessons Virlanie learned from the children they care for. This calendar is the perfect Christmas gift that would surely brighten up the day of your friends and family. Proceeds will help nourish street children. You can also send your friends a copy of the above ad, Post or Like it on your Facebook, or Tweet it to take part in giving a smile to street children. *Shipping will be limited to Manila residents only. Delivery costa is to be shouldered by the donor. Thank you! Visit http://www.virlanie.org for more details.